Our Gotu Kola plants are thriving in a couple of pots in our terrace. The leaves are not as tender as the Shiny Bush's. They're okay though when mixing in a salad. Usually, I just chop them up and add them to the Shiny Bush or Pansit-pansitan that we get from our yard. I just then mix them up in a small bowl of vinegar with onions and ground black pepper. And that's already a side dish at dinner. The white spots on the leaves shown above are actually droplets of water. Gotu Kola or Centella asiatica is used as a leafy green in Sri Lankan cuisine, where it is called Gotu Kola. In Sinhalese (Sri Lanka) Gotu means "conical shape" and Kola means "leaf". In India it is popularly known by a variety of names: Bemgsag, Brahma manduki, Brahmanduki, Brahmi, Ondelaga and Gotu Kola. Native to Madagascar, India and Sri Lanka, Gotu Kola is a member of the carrot family. The leaves and stems are where the therapeutic benefits lie. Ancient peoples thought that Gotu Kola increased longevity as they observed elephants feeding on the herb. Gotu Kola facts show it has been used for years to treat a variety of conditions. Gotu Kola is commonly found growing naturally throughout tropical, boggy areas of India, Pakistan, Sri Lanka, Madagascar, and South Africa. It is also found in similar climates of Eastern Europe and few other regions throughout the world. Gotu Kola grows either from seed or by division of existing plants. It prefers a moist position in soil enriched with organic matter and does best in a semi-shaded position. It will tolerate full sun though the leaves will not be as large or as succulent. The crop matures in three months and the whole plant, including the roots, is harvested manually. If you research the internet for Gotu Kola, you'd probably conclude it's the cure-all herb. For many thousands of years Gotu Kola has been used to treat a variety of conditions including syphilis, hepatitis, stomach ulcers, mental fatigue, epilepsy, diarrhea, and fever. Today Gotu Kola is used to relieve symptoms of poor circulation in the veins of the legs and to speed the healing of wounds and burns. Some uses for Gotu Kola include the reduction of fatigue, the strengthening of memory, and in treating venous insufficiency. Varicose veins, circulation, and wound healing are also aided by Gotu Kola. Gotu Kola helps increase longevity, prevents memory loss, and it is also used as an aphrodisiac. A popular folklore tale from Sri Lanka speaks of a prominent king from the 10th century AD named Aruna Withane who claimed that Gotu Kola provided him with energy and stamina to satisfy his 50-woman harem. More recent studies confirm many of Gotu Kola's traditional uses and also suggest possible new applications for Gotu Kola, such as lowering high blood pressure, treating venous insufficiency (pooling of blood in the veins, usually in the legs), boosting memory and intelligence, easing anxiety, and speeding the healing of injuries. That ITS NOT Gotu Kola. 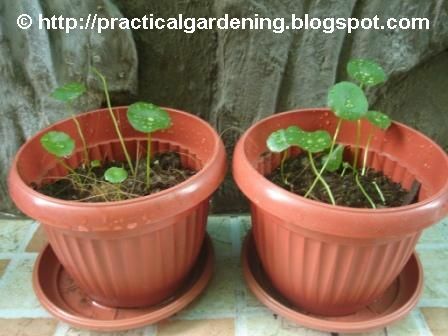 Sorry but I had been growing the plat for many years and the one i the pots in the photo is no Gotu Kola. Its a look a like plant that requires lots of water like gotu kola but it is other species. I studied agricultural sciences and my specialization is in medicinals plants from the tropics. Why do you say so? I must admit the photo is in low resolution and a bit blurry. The "white spots" you see on the leaves are actually water droplets from a heavy rain. That's a noxious garden weed according to American lawn enthusiasts, known as the dollar weed. It is edible but it is not gotu kola.